145 proposed activities were discussed in the Development Planning Forum (Musrenbang) of Rawabunga Urban Village, Jatinegara, East Jakarta, Monday (1/29) night. From the proposals, the required budget was Rp 25,252,049,380.
" I appreciate the proposal in Rawabunga Urban Village, as it is very varied"
Musrenbang opened by East Jakarta Mayor, Bambang Musyawardana was attended by several officials. They were Industry and Energy Sub-dept. Head, Nurhidayat; Communication, Informatic and Statistic Sub-dept. Head, Yuliarto; Jatinegara Sub-district Head, Nasrudin Abu Bakar and so forth. 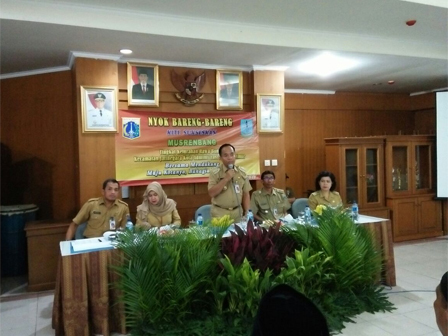 There were also nine RW caretakers, religious figures, youth organization Karang Taruna members, FKDM. Musyawardana hoped that it was to keep prioritizing the priority scale, as needed, instead of desire. It is because only few proposals would be accommodated. Considering proposals would be corrected, ranging from the sub-district to the city and the province. "I appreciate the proposal in Rawabunga Urban Village, as it is very varied. It's not always physical, but also non-physical activities," he stated, Tuesday (1/30). Rawabunga Urban Village Head, Agustina added, 145 proposed activities were divided into some ways. But those proposals were dominated about road and water channel repair. It had been noted that road repair was about 57 proposals, water channel repair was 54 proposals, streetlight repair was 17 proposals, work training was 4 proposals, art and culture was 3 proposals, etc. "Our priority scale is road repair at RW 02 that is damaged by about 200 meters. Hopefully the proposal will be realized soon," he uttered.